iMachines® are the ultimate expression of the RenEx philosophy. 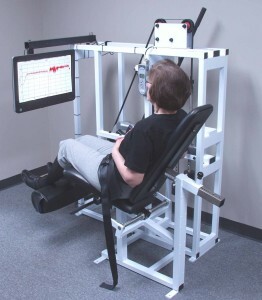 Revolutionary computerized load sensing feedback systems perfectly integrated with ergonomically handcrafted isometric exercise stations. Each machine is cleverly designed to facilitate potent muscular loading via Timed Static Contraction™ (TSC) protocol to individually targeted muscle groups. From intricate rehabilitation to formidable pre-exhaust techniques, workouts can be instantly tailored to the broadest spectrum of clients and applications, all at the touch of a screen. The RenEx iMachines: This is the Future of Exercise. 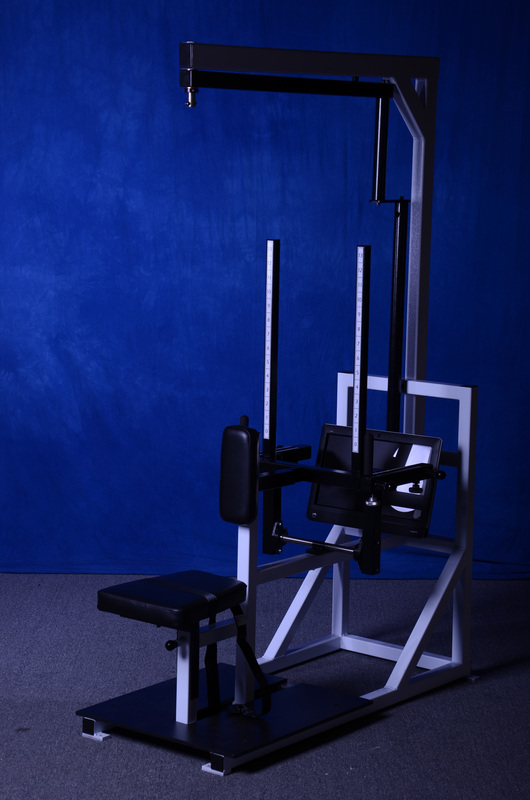 The RenEx Isometric Pullover/Pull Down machine facilitates the performance of four distinct TSC exercises: Pullover, Pull Down, Biceps and Triceps. • Vertically adjustable Pull Down handle. • Extra wide arm pad. The RenEx Isometric Leg Curl/Leg Extension machine provides ideal positioning for TSC exercise for the knee joint. • Single load-cell system with integrated adjustment for switching from knee flexion to extension. • Adjustable back pad and tilting seat. • Movement arm extension handle for instructor. The RenEx iMulti machine can be used to perform over 15 different TSC exercises. • Uniquely designed single load-cell system combined with pillow block bearings creating a “floating, frozen movement arm” for tension or compression exercises. • Easy entry seat with integral chest/back pad. • 360-degree computer monitor arm to provide feedback from any sitting position, complete with easily accessed force gauge for immediate tarring of arm. • Extra tall vertical tubes to accommodate various heights of users. • An assortment of webbing straps for various tension exercises. about 120 or 130 degree angle. Is this correct? There is a range that works best…email one of the guys and review the script and we should be able to get you there. I have experienced the great service that Overload provides on both the full range of motion machines and the iMachines. I have to commend everyone involved in the development of these machines and the protocol. I think the instant feedback and attention to design make these machines the best tool available to help a trainee quickly develop the skills to effectively inroad. Thanks! This is a great way to get a new client in tune with the primary exercise objective. Josh, i see what you mean. This stuff looks great! Especially the AFTI (Advanced Force & Torque Indicator). Looks like it allows for more precise application. Great work guys. Ingenious, practically a complete business with only three machines. Wondering how TSC could be applied to Hip Extension-low back, and if shoulder shrug can be done on the iPOPD? You can do TSC Leg Press on our dynamic machine along with TSC Trunk Ext on the dynamic Trunk Extension machine. The iMulti is set up for an excellent version of Trunk Flexion and Trunk Extension. TSC Shoulder Shrug can be done on the Leg Press. 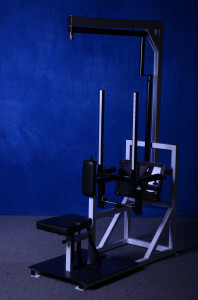 Would it be possible to put a shoulder pad extension arm on the iPOPD+ to allow for a TSC leg press/squat? Leg Press Machine w/ feedback is best here. “I” this “I” that? Really? Are they made by Apple? No offense, but what a silly way to name a line of potentially revolutionary equipment. i own the trademark for iMACHINES. Mike, we welcome any ideas for a more appropriate name badge. i is relevant as it commences the word isometric . So many possibilites with these Timed Static machines. Great work! yes sir….there is a lot….I will write an article on some of the best combos. the “Terminator” says, machines will rule the world. Although the article makes sense to me and I am extremely impressed with this advancement in technology, I will reserve my thoughts, because I would neither be qualified to comment or have a subjective experience with which to reference to. I will need to see & experience these machines to fully appreciate the direct ‘exercise’ effect fully. You much to see when you make it into Cleveland! Looks like you guys put an incredible amount of work into these machines. Man, make me tired thinking about it all that you had to do to put this together. There are few that can comprehend the time, $ , and expertise that went into them, but I know you are one of a very few that could predict how much. Simple little machine frames right??? well I tell you something the prototypes and “do-overs” were far greater in time at expense with the iMachines compared to the Dynamic. There are far more variables that even we considered. It would be COMPLETELY impossible to make The iMachines w/out gaining the experience on the exercise’s dynamic counterpart. It really was an interesting process and a difficult one to get the machines as responsive as they need be. Another interesting thing is if you look at some of the hate mail online most, who lack the experience, are focused on the software….which is crucial but feedback is only 1/2 of the equation. The assumption that another line could compete just because their machine has a readout is beyond ignorant. Its the same as saying two machines have a selectorized weight stack therefore they are the same. The field of motor learning will help us to continue to develop the software for these machines but w/out the right positioning, upholstery, rigidity, ability to arrest reactionary force, consideration for synergy pattern, and friction free articulations where movement WOULD occur if it were dynamic exercise…without these things….SMH….You own nothing more than a high priced scale….maybe one than can dump on ya so you can view big numbers. Give me a break! Charles Atlas revisited? Dr. Zeigler developed isometronics which are far better than ANY….”no movement” isometric exercise. If Dr. McGuff endorses this type of isometric training, I’m done with BBS. Mentzer, Darden, and Arthur Jones never endorsed isometrics as a stand alone HIT technique. Comment is revealing demonstrates complete ignorance but is heavy on the hate factor. but John Little and Pete Sisco did. John was a good friend of Mike Menzter and from what i have read got Mike expermenting heavily with iso/static work towards the end of his life. Perhaps if “MarcPharm” looked into Dr. Ziegler’s bio closely enough to spell his name correctly, he’d also notice that exercise had virtually nothing to do with any results his methods achieved. “Isometrics for the neck wrist and midsection, and for certain reasons. Hmmm, “…certain reasons…” , that’s specific…and convincing ;-). Apparently you’ve psychically determined that other party’s “certain reasons” aren’t as good as yours. “Stand alone”??? Did you hear about all this 3rd hand? Guess what?, “MarcPharm”: Most RenEx machines -aren’t- isometric..
To those of you that are complaining about the trolls coming out from under the bridge, no worries….the walls go up in just a few more days…. Preaching to the choir is so much easier, and much more satisfying. …..landslide of information coming in June……..
Looks great, Josh. You’ve made me even more impatient to receive my iPOPD. I used to be one of RenEx biggest critics for sure. But I always came at RenEx with an understanding of how much work all of this. The thing is most of the critics just sit on there buts and criticize. When you personally are putting your own time and money in to keep HIT going the critics must get really old. At least there are some nice comments here and you are getting some thanks for all of your teams hard work. In the end all you guys are doing is trying to help people. In return, you get dumped on a lot by people who are entitled and have never been down at the woodshed. At least if one is going to be super critical, one should try their hand at building machines, running a studio and so on. The new project that you got me involved in is very interesting. I am very excited about it. But after reflection, I do wonder if you should even bother sharing it with people who aren’t clients of yours. I don’t know what the point is? We already put a lot of work, time and money into it. It will benefit everyone’s thinking on exercise even if they never use what we are working on, but I am sure the very people it will benefit from our hard work and money will attack RenEx like crazy. If these new machine are getting attacked, I am not sure I want to see what is coming next with the new project and introductory article. I don’t see anything wrong with taking it all private? Or not even sharing the new project from seeing some of the criticism of these machines. I don’t see what the upside is to being attacked for doing projects that benefit people in HIT for free. Yes they may never buy or use what you make, but from an intellectual aspect there is benefit even if the your products are never purchased. It is fun to watch people doing ARX Omni machine using RenEx methods. LOL. You guys keep people engaged and thinking. But what is the upside to you for all of this? I have no desire to give away any more…June 1st we go to a pay format, as far as I’m concerned everything should be that way. People will continue to criticize yet offer no alternatives, it never ends. I could care less the only reason I do this is to improve my own personal workouts. I cannot express to you the self discovery that statics with feedback has provided in my own pursuit for inroad. I have been working out at Overload FL twice a week for over a year now. Every workout is a learning experience under the expert guidance of the staff and I am continually amazed at what I don’t know. What I do know is I continue to get stronger and improve my health (fat loss, added lean muscle and improved blood pressure to name a few). My wife, who was somewhat of a skeptic, has now joined me and she too is experiencing the benefits. Your path is honest and just. Please continue to help us all discover what makes us better and healthier. I suggest that anyone who doesn’t believe that the RenEx static protocol is effective should do an unmonitored at-home version with any tools at hand, (doorway, rope, opposing body parts…). 90 seconds of honest effort is something I doubt that most of them will muster up. Going out and gaining experience 🙂 ? a lost art! Always interested in the Ren-Ex projects. What are the details for the pay format? Thanks! Sorry for the delay we should have those details up inside of the next week, everything always takes longer than i think it should. How does RenEx make money anyway? db144 Reminds me of drunk getting thrown of a bar, who, on his way out, wants to discuss the bouncer’s life with him: “How much do you even make here, man?” The proper response is a slap, (which adds at least as much content as d’s comment). Couple things to mention. I have been doing TSC for my right arm/shoulder since an injury a few months ago. The last “as hard as you dare” segment is a killer, mostly due to wondering if I can push even harder. It can make my whole body quake, much more than dynamic. I just love the knowledge we have gained that enables us to work around injuries. An observation I made recently – which may be old news to everyone else – is that with TSC and no read-out/force cell, it is appropriate to tell the subject to, once their starting strength is sufficiently reduced, to maintain their force output, not level of effort. If effort remains the same, force goes down with fatigue. If force remains the same – just like with dynamic – effort goes up. A dramatic example would be if the subject were told to maintain a 50% effort. He may never produce enough force or induce enough fatigue to stimulate an improvement. If your idea works in the gym, great, but without a readout, force vs effort becomes a matter of semantics. Effort is subjective, force is objective. An experienced trainer will note signs of effort %, and coach accordingly, incidentally maximizing force, but nonetheless is only, in fact, observing effort.